The board of controversial mining giant BHP Billiton is set to be slammed at its AGM by an Indonesian activist over seven coal concessions collectively covering an area of more than 350,000 hectares in the relatively unspoilt rainforest centre of the island of Borneo. Part of this project overlaps the transnational Heart of Borneo conservation area, described by the Asian Development Bank as “the lungs of Southeast Asia”. Hendrik Siregar, Coordinator of JATAM (The Indonesian Mining Advocacy Network), will be attending the AGM to raise his concerns about the Indomet project in Central and East Kalimantan. The Indomet project is a joint venture with Indonesia’s second biggest thermal coal producer PT Adaro. BHP Billiton holds a 75% share, with Adaro holding the other 25%. Community leaders from Maruwai village next to the planned Haju mine do not want any more mining companies to come to their lands. The pollution and destruction caused by existing coal mining has prompted them to reject the advancing spread of mining corporations like BHP Billiton, which threatens to destroy their health and livelihoods. Hendrik Siregar’s trip to London follows a visit to Indonesia and the site of the Indomet project by the UK organisations Down to Earth and the World Development Movement and coincides with the launch of a report by the World Development Movement called “Banking while Borneo Burns”. The report highlights the wide-ranging complicity of UK investment in Indonesia’s ‘coal rush’, which is so devastating for local communities and their environment. Hendrik will also be meeting with parliamentarians, investors, the UK government and the public as part of his trip. 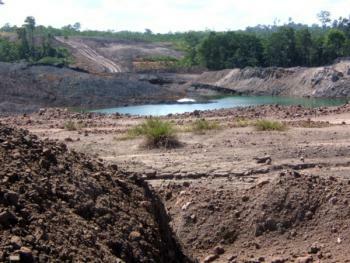 The extent of corporate involvement in Indonesia’s coal sector – backed by the UK government has recently emerged through a series of scandals and new independent reports : the Bumi plc scandal; Standard Charter’s billion-dollar loan to the Borneo Lumbung coal mining company; loans to BHP Billiton from HSBC, RBS, Lloyds and Barclays and UK links to a proposed controversial billion dollar railway infrastructure project to ship out coal from the Heart of Borneo. Hendrik Siregar is available for interview and comment during his time in London. Contact Andrew Hickman on +44(0)7504738696 +44(0)7504738696 to arrange it. Laying waste to the forests: coal’s impacts on local people’s land and livelihoods in Central Kalimantan. Hendrik will be speaking at Dirty Energy, a free event in London at 7pm on Thursday 24th October, organised by London Mining Network, Colombia Solidarity Campaign, Down to Earth and the World Development Movement. This event is part of WDM’s Carbon Capital speaker tour and is being held on the day of the AGM of mining company BHP Billiton.